Making the most of a weekend in the house, I started my annual seed stocktaking. It takes a lot of time and I have not learned to use it in the most effective way for my planning, but I think it is worthwhile to persist. Unfortunately this year I have been very bad at recording crops and produce. I only know that I made 22kg of potatoes (half compared to last year), a bucketful of onions & shallots (of unspecified weight), more garlic than last year but still not enough for my consumption, more than enough spinach beet, some broadbeans (enough to store some freezed but less than last year), plenty of strawberries, just enough raspberries, too many gooseberries. And some turnips, courgettes and beetroots. Plus a couple of salads' worth of ripe tomatoes (many more than last year), two cucumbers and a negligible amount of beans. And and let's not forget a bonus of damsons from the hedge at home. Not very specific, uh? It has been a very different year from last year, in terms of weather and my time availability, so it is difficult to draw general lessons. Certainly I have had success in growing a greater variety of crops, and I seem to have a better grasp of the seedling process (although there seem to be a stage beyond which many of them don't seem to grow any further and sooner or later perish). Well, there are still seeds to sow and things to do this year. Let's hope next weekend nothing goes wrong. For a start, I am planning to cover my only aubergine and try to keep it for another year, if it survives the winter. There's my blueberry and artichoke to plant, and all the chrysanthemums I bought to cover the ground over winter, although some green manure can still be sown: Hungarian grazing rye is at the limit of sowing time, but field beans are still ok. And then broadbeans are ready and garlic, although Paolo at Seeds of Italy thinks it's still too early to plant it this year, because of the good weather. And I will leave you with the edifying thought that potatoes are tetraploids (they have four sets of chromosomes instead of two as 'normal' plants have) and the mentioned chrysantemums have six sets - not clear yet how and why, but you will have understood that my current chapter in the course is cells growth and reproduction. 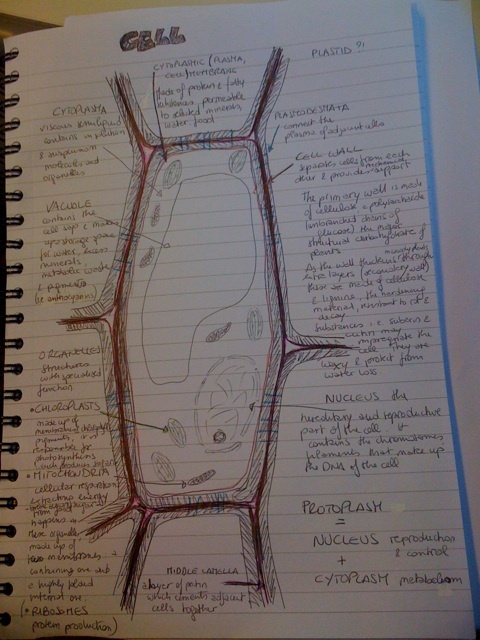 Here is my beautiful (copied) drawing of a plant cell.